Those fighting tuberculosis (TB) say it is better not to treat the disease than to treat it badly, because doing so just produces more powerful, drug-resistant bacteria, making the world's second-most fatal disease stronger by the day. The mainland has more cases of multiple-drug-resistant TB (MDR TB) than any other country, with 120,000 new cases each year. Poor case management and a lack of new drugs makes the fight against the disease extremely difficult. Dr Zhao Yanlin, director of the National TB Reference Laboratory, has said that the mainland has a "serious epidemic" of drug-resistant TB, but the situation "could easily be much worse". Also deputy director of the National Centre for Tuberculosis Control and Prevention at the Chinese Centre for Disease Control and Prevention (CDC), Zhao contributed to a paper published in The New England Journal of Medicine in June about a mainland-wide survey of drug resistant TB. The survey found that 5.7 per cent of new TB cases and a quarter of previously treated cases were multiple-drug resistant. Drug-resistant TB emerges when patients fail to follow treatment regimens, which takes six to eight months and use a cocktail of drugs, or stop treatment too soon. Some patients stop taking medicine after one or two months of treatment, when the coughing stops and the symptoms are gone, but the bacteria are not eliminated and the symptoms will come back. When the TB bacteria is not fully eliminated, it can mutate, re-emerging later as a strain resistant to the small range of drugs able to fight the disease. Other people can then be infected with MDR TB. Wang Weibing, an associate professor in the school of public health at Shanghai's Fudan University, said the improper treatment of TB patients played a large part in the prevalence of MDR TB but that patients were not the only ones to blame. "We can't always blame patients who do not follow the treatment regime," he said. "They should not be held entirely responsible, because of the side effects, such as nausea. We need to invent a much shorter or better treatment regime." In the mainland-wide survey, more than 40 per cent of patients with MDR TB who had previously had treatment for TB had not completed their last treatment course. The paper said a quarter of TB patients treated in the public health system received inadequate treatment because they had MDR TB but were still given first-line TB drugs as part of standard treatment. "Addressing MDR TB in China will require selection of treatment regimens on the basis of testing for initial drug resistance," the paper said. "It is also important to improve treatment in TB hospitals and enhance the continuity of treatment after patients leave the hospitals." Mainland TB patients receive treatment at either local disease control and prevention centres or designated TB-treatment hospitals. Hospitals provide limited outpatient follow-up, while the CDC system does a better job because it is responsible for monitoring patients with TB in the community. Patients being treated at local TB clinics should be tested for drug resistance before the start of treatment, with treatment options based on the results, but such tests are not routinely performed at TB hospitals. Furthermore, 11 per cent of patients with new cases of TB in the survey reported that they had been given TB drugs in the past, even though they had never been diagnosed with TB. The paper said such patients had a higher risk of developing MDR TB. 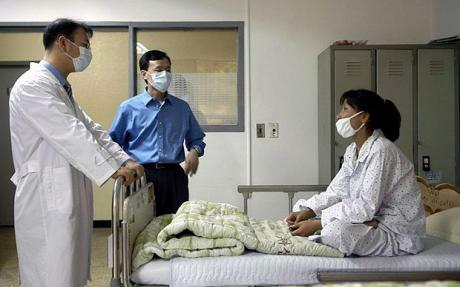 Professor Xu Biao, director of Fudan's TB Research Centre, said county-level hospitals were not following national guidelines when treating TB patients, resulting in increased drug resistance. "The use of second-line anti-TB medicines was found in newly diagnosed TB patients without bacteriological confirmation and the prescription of the second-line medicines mainly depended on the treatment history of the patients rather than the patients' drug resistance profiles," she said. "It may have to do with poor TB training or simply wanting to see a quick improvement, but the side effect is that it leads to a high rate of drug resistance or even extensive drug resistance." A former CDC official said the mainland's treatment protocol was only strictly followed in 41 cities involved in a co-operative project managed by the Global Fund to Fight Aids, Tuberculosis and Malaria and mainland health authorities. According to a Ministry of Health treatment guideline, each patient should receive individual diagnosis, treatment and case management, but she said a lack of funding and shortage of staff meant it was followed poorly in other areas. "We need really professional doctors with extensive experience in treating TB, but only provincial-level hospitals can guarantee that," she said. All these problems point to the importance of quick diagnosis tools, more effective drugs and a shorter treatment regimen. TB is mostly diagnosed through a combination of X-rays, liquid culture, microscopic examination and the TB sensitivity skin test, but these methods have flaws in terms of sensitivity, specificity and speed. In 2010, the World Health Organisation recommended the use of GeneXpert, a tool that can detect TB and drug resistance in less than two hours. Even though the Swiss NGO Foundation for Innovative New Diagnostics has negotiated a concessional price of US$17,000 for the equipment and a fee of US$10 per test, the savings were not yet apparent on the mainland. "So far no government agency has taken the lead in negotiating the concessional price," said Huan Shitong, senior programme officer with the Bill & Melinda Gates Foundation's Beijing office. The foundation invited bids from more than 100 companies in September to develop and produce a similar but cheaper version of GeneXpert in China.